I'm starting to really love kale. It cooks quickly, and its texture never gets too mushy or slimy. I've been buying it weekly at the winter farmers' market, and lately have been trying to incorporate it more in main dishes, rather than just sides. 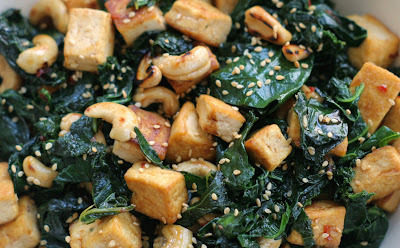 We usually eat kale roasted or sauteed, but for lunch today, I decided to try stir frying it with some tofu and cashews. It came out quite nice - the kale soaked up the sauce even better than I had expected, and the different flavors and textures worked well together. The sauce I used here is a basic formula I've come up with after some experimenting - I like the balance of sour, sweet, savory, and spicy that it has. I used a mixture of curly kale and Tuscan kale for this. Either one is fine, but curly kale soaks up the sauce a bit better. This stir fry is really good on its own, but you could also serve it with rice or noodles. Cut tofu block into 1/2-inch-thick strips. Place strips on 3 layered paper towels, and top tofu with 3 more paper towels. Put a cutting board on top of the towels and place a heavy weight (such as a cast iron skillet) on the cutting board. Press tofu under weight for 30 minutes. Meanwhile, force garlic through a garlic press and set aside. Remove ribs from kale and roughly chop the leaves. Rinse and drain the leaves, but do not fully dry (the residual water will help them cook). Mix together soy sauce, oyster sauce, hoisin sauce, sambal oelek, and cornstarch in a liquid measuring cup. Add broth or water to bring volume to 3/4 cup. When tofu is done pressing, cut into cubes. Heat a wok or large skillet over high heat for 2 minutes. Carefully add canola oil and sesame oil (oil may bubble and splatter when it hits the hot wok). Tilt wok to coat sides and bottom evenly with oil. Add tofu and stir fry until until browned, about 8-10 minutes. Transfer tofu to a bowl. If wok is dry, add a splash of canola oil. Add cashews and cook for 2 minutes, stirring constantly, until golden brown. 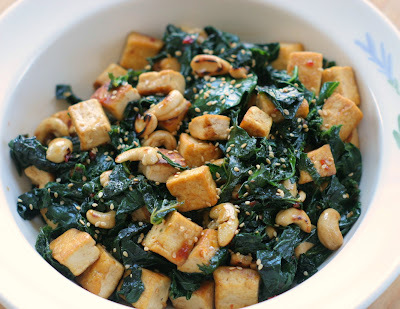 Transfer cashews to bowl holding tofu. Add kale to wok and toss with tongs until kale is bright green and excess water has evaporated, about 3 minutes. Clear a space in the center of the wok and add a small splash of oil if dry. Add garlic and stir fry in the center of the wok for 30 seconds, then toss with the kale. Return tofu and cashews to the wok and pour in sauce. Toss to distribute sauce evenly. Take wok off heat as soon as sauce thickens - this may only take 30 seconds or so on high heat. Serve immediately.